In these days Riccardo is located in Miami with his dear friend Emanuele Della Rose at Thump Boxing Gym in preparation for their respective match on September 16, where the two boxers will fight in the same event. 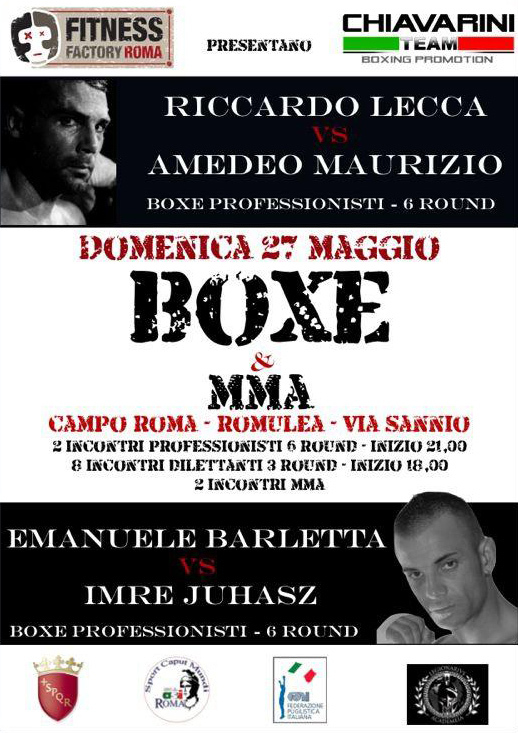 Emanuele will fights a 10 round match; just 8 rounds for Riccardo. They’re getting ready with great Cuban coach Eufracio Gonzalez, among others, the training of Braidis Prescott (winner by KO against Amir Khan). So definitely a unique experience for Riccardo who will come back home in early September 100% ready for his match! Another difficult task for Riccardo, in his attempt to climb the charts for the Italian superwelter title. 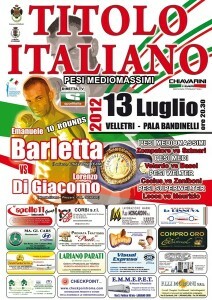 This is the time to face the experienced Michele Mottolese (10/01/12) a good and tall fighter. Riccardo feels calm and well prepared to deal with this opponent. 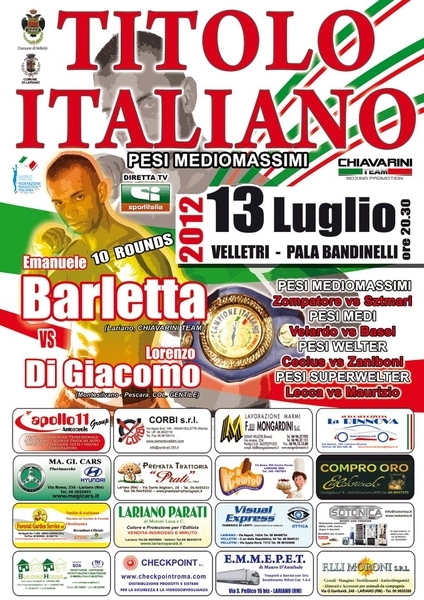 The match will precede the Italian light heavyweight title between Lorenzo Di Giacomo and Emanuele Barletta. A good boxing Sunday in the historical neighborhood of San Giovanni: Alberto Chiavarini in collaboration with “Fortitudo Boxe” set up a very nice sport event on Campo Roma. Short but very exciting the match between Riccardo Lecca (+4 -0 =1, 1 ko) and Giovanni D’Antoni (+4 -2 =1, 1 ko) from Catania; flash victory for Emanuele Barletta (+9 -1, 6 ko) who outperforms the Hungarian Imre Juhasz (+1 -5, 1 ko). The match clou maintain it’s promises, Lecca e D’Antoni faced out without fear with broad strokes since from the first round. Too bad for the stoppage after only four rounds, the match was in perfect balance. A cut on the D’Antoni’s face caused by a stroke forced the referee (Mr Marzuoli) to first consult with Dr. Bonanni and soon to declare a stop. We need a rematch! Saturday May 26, 2012 at the Fitness Factory gym Mohamed Atik will take a 3 hours stage from 10,00 AM – 1,00 PM. Mohamed come from Marroc but he live in Holland, where he works in the most prestigoius Amsterdam gyms. Atik also has trained Alessio Sakara and follow Riccardo over his preparation for the european K1 title! An interesting opportunity to see and practice the methods of the Netherlands technical training, one of the most successful school in the world of ring sports! 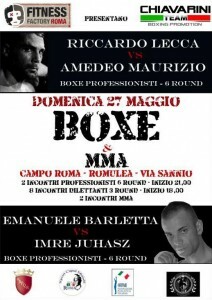 Amedeo Maurizio is injuried, he will cannot face Riccardo on May 27 in Rome. 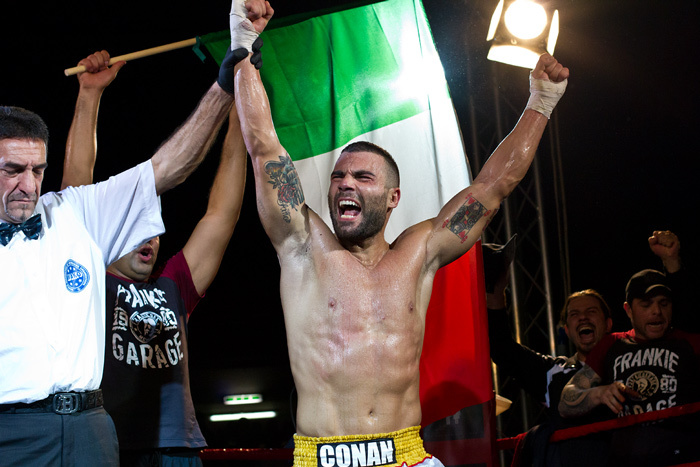 Giovanni D’ Antoni (4+2-) replaced him, a sicilian and more skilled boxeur. An important test for Riccardo who wants climb up the superwelter italian ranking and have a chance to challenge for the title. A boxing match is coming for Riccardo, in a middleweight fight. His opponent, Amedeo Maurizio come from Abruzzo with just one match, lost by points with Manuel Grimieri De Ioanni. Riccardo is training hard in his new gym (who manage along with Alessio “Legionarius” Sakara in Roma) and with his team. Prima ripresa, ottime combinazioni di Riccardo Conan Lecca che si propone subito in avanti, padrone del ring. Seconda ripresa, il romano molto solido scambia e non arretra di un passo, buon tip al viso a favore di Tomic. Terza ripresa, gancio sinistro preciso al viso a favore di Lecca, Luka viena richiamato ufficialmente dall’arbitro perchè gira le spalle all’avversario, low kick ed high kick ripetuti ai danni di Tomic, ginocchiata al fianco a favore di Riccardo. Ha vinto RICCARDO LECCA ai punti al termine delle 5 riprese. 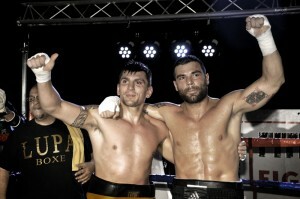 E’ il nuovo campione WAKO PRO EUROPEO K1 Rules.